Fresh Season: Primarily from December through March. 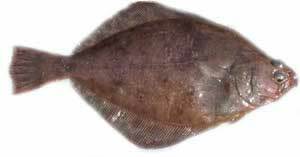 Petrale sole are a large pacific flounder and not a true member of the sole family. Flounder are rounded in shape whereas true sole are more elliptical and deeper bodied. Petrale’s appearance is light to dark brown on the upper-eyed side and white on the bottom. It is a right-eyed flatfish. To distinguish a right-eyed flatfish from a left-eyed flatfish, hold the fish with its belly toward you and the eyes on top. Right-eyed fish have the head at the right hand end. Petrale sole range from northern Baja California to the Bering Sea, in depths ranging from 15 to 2,200 meters. They go through an annual migration of sorts, but it is not up and down the coast but rather from shallow-water summer feeding grounds to deep-water winter spawning grounds. The spawning season is from December through April, and this is also the time of year when most of the annual catch is landed. Petrale sole, like wild salmon, return to specific areas to spawn. Fishermen know the location of many of these sites and the fish can be caught in much greater volume by targeting these locations rather than fishing all over the shallows they roam during their summer feeding frenzy. Their diet includes crabs, shrimp, and fish such as anchovy, hake, small rockfish, and other flatfish. Petrale sole is the most important species of flounder caught on the West Coast. Market size is about two to three pounds whole, with fillets ranging from two to eight ounces each. Petrale sole produce fillets that are thicker than those of other West Coast flounder, and the meat is firm. By comparison, the meat of many others is soft. The raw flesh ranges from pearly to pinkish white to snow white. The flavor is mild, delicate, and sweet. The texture and delicate flavor of this fish make it ideally suited to the elaborate use of sauces, herbs, and spices.